The Velothi Mountains are the mountain range separating Morrowind from Skyrim. They are named after the Chimer prophet Veloth who led the Chimer to leave their ancestral homes and resettle in Morrowind. 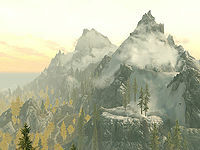 The mountains form the eastern border of the Skyrim regions of Eastmarch and the Rift. The southernmost part of the mountains borders the Morrowind region of Stonefalls to the southeast. At the southern tip of the mountain range, where it meets the Jerall and Valus Mountains, the volcanic peak of Trolhetta can be found. The ash produced by this and other volcanoes falls upon the Stonefalls region, providing precious fertilizer in an otherwise arid landscape. 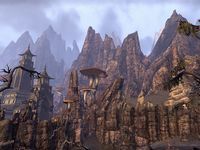 In the Late Middle Merethic Era, the Velothi Mountains were settled by the Dwemer, who created cities beneath the mountain range, such as the great city of Mzulft. Presumably most of these cities followed the fate of their counterparts in Morrowind and Hammerfell and now lie deserted, but no further information on the cities exists. In 2E 864, a canopy tunnel provided easy travel to the mountains from Cyrodiil, but no trace of the tunnel remained by 3E 433. Some old Dwemer tunnels also existed beneath the mountains and were sometimes used by caravans and refugees from Morrowind circa 4E 201. The Dunmeth Pass leads through the mountains and into northern Morrowind. High in the mountains lies the ancient temple of Skuldafn, along the Eastmarch border.